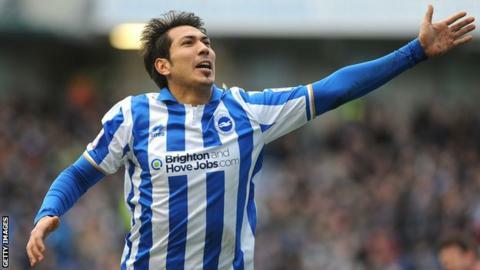 Argentine forward Leonardo Ulloa scored a hat-trick as Brighton stayed on course for the Championship play-offs with a big win over Huddersfield. The 26-year-old headed in the first from Andrea Orlandi's cross but James Vaughan levelled from close range. Ulloa restored the lead with another header to spark three goals in five minutes as Huddersfield folded late on. He rounded Town keeper Alex Smithies to score his third before David Lopez's penalty completed the rout. Brighton's third straight league win keeps them sixth, while Huddersfield are now just five points above the relegation zone after conceding 24 goals in their last 10 Championship games. Ulloa only arrived at the club from Spanish club Almeria in January but he has now scored five times in seven matches to help Brighton's promotion aspirations. His opening goal came from Orlandi's whipped near-post cross which he met with a fine header but Huddersfield were level before the interval, former Everton striker Vaughan finishing from Oscar Gobern's 42nd minute cross. Lopez could have had a second-half hat-trick of his own but Town captain Peter Clarke cleared two efforts off the line while keeper Smithies kept out a drive. But any thoughts the visitors may have had of heading back to Yorkshire with at least a point were shattered by Ulloa's powerful 12-yard header from Lopez's cross in the 76th minute. And three minutes later Ulloa latched onto a long pass from Inigo Calderon before rounding the keeper and rolling the ball into the net to complete his hat-trick. Brighton made it four in the 80th minute when Paul Dixon brought down Craig Mackail-Smith in the area and Lopez coolly tucked home the penalty. "When you sign a player like Leo you want to show to people why you signed him. "We didn't have the kind of player he is and his second goal especially showed his quality. He has timing, jumping and power. "During the week he was really confident and that is the key. You have to trust your own ability and he trusts his ability, especially with heading. He really believes in what he does." "For 74 minutes I thought we'd get something from the game. "But it wasn't a corner and then we conceded. We can't blame the referee but the second goal led to a capitulation. "The two goals that followed came as a result of us thinking about the mis-fortune we suffered. Up to then Brighton hadn't hurt us very much."